Legend has it that clams casino was first served at the Narragansett Pier Casino in Rhode Island in 1917, or possibly earlier. It is fun to imagine dining at this luxury resort on the water 100 years ago. Eater.com featured an in depth article about the history of clams casino, which I found fascinating. If you’d like to learn more, I think it’s an interesting read! The dish has stood the test of time for good reason. 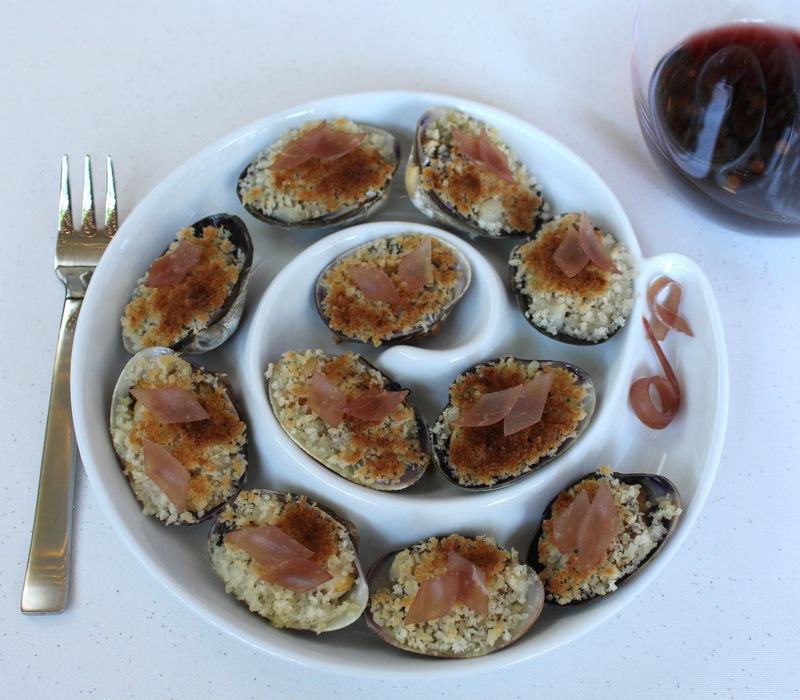 Traditionally the clams are served on the half shell and topped with toasted breadcrumbs and bacon. How can you go wrong with that? 😉 I used panko breadcrumbs and prosciutto for my version. Place your oven rack in the middle and preheat the broiler. Set aside a casserole dish that is large enough to hold all of the clam halves in a single layer. In a large sauté pan with a lid, heat the oil. Once the oil is hot and shimmering, cook the shallot until softened. Then add the garlic and red pepper flakes, and cook until fragrant. Add the white wine and stock, and bring to a boil. Add the clams, cover the pan, and cook until they are just opened. Transfer the opened clams to a plate to cool slightly. Season the broth with salt and pepper. Remove the top shell of each clam. (I found that kitchen shears worked well.) Loosen the meat from the bottom shell. Place each clam half in the casserole dish. Spoon a little bit of the white wine mixture (that the clams cooked in) to each clam. Top the clams evenly with panko. Spray the top of the breadcrumbs with a light coating of cooking spray. Broil until the panko is lightly golden brown, about 3 or 4 minutes. Watch them very carefully so they don’t burn. Top each clam with a small piece or two of prosciutto. Serve immediately.